Lukas Podolski struck twice as Arsenal came from behind to beat West Ham and move back above Everton in the race for a Champions League place. 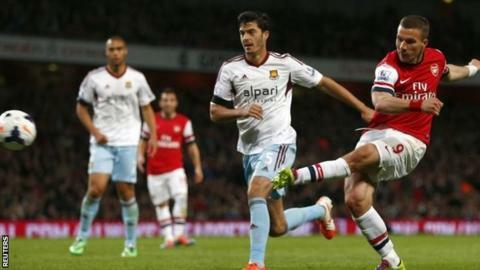 Matt Jarvis headed the Hammers in front as they threatened to extend Arsenal's winless league run to five games. But Podolski levelled with a shot on the turn two minutes later for the impressive FA Cup finalists. Olivier Giroud's classy finish and Podolski's driven second sealed the win as Arsenal moved up to fourth. Fresh from sealing a place in the Cup final courtesy of their penalty shoot-out win over Wigan, the result was just what Arsene Wenger's side needed to enhance their chance of qualifying for the Champions League for a 17th successive season. Arsenal have now won seven successive Premier League games against West Ham. Double-scoring Lukas Podolski was on target for the third successive time against the Hammers. Olivier Giroud also likes scoring against West Ham, with his first goal in the Premier League coming at Upton Park last season. The Arsenal starting line-up was the oldest selected by Arsene Wenger for a Premier League game since May 2003. With Everton playing against Crystal Palace at Goodison Park on Wednesday night, the Gunners could ill afford another slip-up following their recent poor league run. And they showed all the resilience - and quality - needed to stay the pace and hold off the determined challenge of Roberto Martinez's in-form side. Podolski took his goal tally for the season into double figures, while Giroud's crucial strike, early in the second half, was his 20th of the campaign. After their efforts expended in ending Wigan's reign as Cup holders, Arsenal, despite making five changes to their starting line-up, actually made a sluggish start to offer West Ham early encouragement. The Hammers, still seeking points to guarantee their Premier League safety, could have taken advantage with Mohamed Diame lifting their best chance over the top from Andy Carroll's low cross. Giroud could not claim tiredness as an excuse after starting on the bench at Wembley but Arsenal's leading scorer was guilty of a terrible miss with almost half an hour gone as Wenger's side improved. The Frenchman was sent clear by Santi Cazorla's fine pass but elected to try to flick the ball past Adrian with the outside of his left foot and failed to generate the power to trouble the West Ham keeper. And the visitors made Giroud and Arsenal pay five minutes before half-time when they went in front through Jarvis. Antonio Nocerino's persistence bursting in from the right-hand side created the chance and when the ball popped up in the six-yard box, Jarvis nodded in only his second league goal of the season. Arsenal would have felt the pressure had they gone in behind at the break but they were quickly level as they found a way through a West Ham defence that had previously kept 13 clean sheets this season. Again Cazorla was the creator following a poor clearance from Stewart Downing and this time his pass was not wasted as Podolski swivelled to drill a left-foot shot across Adrian and into the bottom corner. The goal lifted the mood around the Emirates Stadium and 10 minutes into the second half Arsenal went ahead thanks to a touch of class from Giroud. The striker displayed a brilliant first touch from Thomas Vermaelen's long ball back into the box following a corner and with his second drove the ball through the legs of Adrian from just inside the corner of the six-yard box. The goal sent further confidence soaring through the home side and rather than sit on their lead they went for a third goal to completely kill the game off. Podolski saw a fierce free-kick beaten away by Adrian and the outstanding Cazorla was only inches wide with a swerving left-foot shot. But Arsenal's pressure finally paid off 12 minutes from the end when substitute Aaron Ramsey headed down for Podolski to fire past Adrian and keep the Gunners firing on two fronts. "When the team went through a bad patch with a lack of confidence because of goals going against us, you need to repair that with results and resilience. "It was a gamble to rest players but I said before the game that it was the oldest team I had played at Arsenal, so I trusted the experience of the players. "That experience always helps when your backs are against the wall." "I liked that Giroud used his upper body and got a great first touch to score the goal. He is a great guy and he has gone through a difficult period, but tonight you could see that he is refreshed and he is up for it." "After doing so much to get ahead, not going in 1-0 up at half-time was a big disappointment. The second goal sickened me because the performance meant nothing after that. We didn't create enough. "We've fallen behind in pre-season planning - contracts to new players, along with players in and players out. As soon as you're safe, the planning has to start. That way I don't get shouted at by the wife when I'm on the phone for six hours a day on my holidays." Attempt blocked. Antonio Nocerino (West Ham United) left footed shot from outside the box is blocked. Carlton Cole (West Ham United) wins a free kick in the defensive half. Attempt saved. Aaron Ramsey (Arsenal) left footed shot from the right side of the box is saved in the centre of the goal. Assisted by Carl Jenkinson. Foul by Ricardo Vaz Te (West Ham United). Substitution, Arsenal. Carl Jenkinson replaces Santiago Cazorla. Foul by Kim Källström (Arsenal). Antonio Nocerino (West Ham United) wins a free kick in the defensive half. Guy Demel (West Ham United) wins a free kick in the defensive half. Attempt missed. Carlton Cole (West Ham United) header from the centre of the box misses to the right. Assisted by Antonio Nocerino with a cross following a set piece situation. Carlton Cole (West Ham United) wins a free kick on the right wing. Attempt blocked. Santiago Cazorla (Arsenal) right footed shot from the right side of the box is blocked. Assisted by Aaron Ramsey. Offside, West Ham United. Mohamed Diamé tries a through ball, but Ricardo Vaz Te is caught offside. Substitution, West Ham United. Joe Cole replaces Stewart Downing. Substitution, West Ham United. Ricardo Vaz Te replaces Matthew Jarvis. Goal! Arsenal 3, West Ham United 1. Lukas Podolski (Arsenal) left footed shot from the centre of the box to the high centre of the goal. Assisted by Aaron Ramsey with a headed pass. Attempt missed. Aaron Ramsey (Arsenal) right footed shot from outside the box is high and wide to the right. Assisted by Olivier Giroud. Substitution, Arsenal. Aaron Ramsey replaces Tomas Rosicky. Foul by Thomas Vermaelen (Arsenal). Attempt missed. Andy Carroll (West Ham United) header from the centre of the box misses to the right. Assisted by Pablo Armero with a cross. Per Mertesacker (Arsenal) wins a free kick in the attacking half. Attempt missed. Andy Carroll (West Ham United) header from the centre of the box misses to the left. Assisted by Antonio Nocerino with a cross. Pablo Armero (West Ham United) wins a free kick in the defensive half. Attempt missed. Santiago Cazorla (Arsenal) left footed shot from outside the box is close, but misses to the left. Assisted by Tomas Rosicky following a fast break. Kim Källström (Arsenal) is shown the yellow card for a bad foul. Antonio Nocerino (West Ham United) wins a free kick in the attacking half.